Many elderly experience an exaggerated or prolonged drop in blood pressure in response to postural change. This so called orthostatic hypotension can lead to falling or fainting. At the moment, this disease is clinically diagnosed by measuring the blood pressure in the arm while people are standing up abruptly. However, this method not always represents risky situations in daily life. This project aims at developing an unobtrusive system that measures blood pressure and blood flow, as well as movement and posture, during daily activities. The researchers want to establish a set of minimal and most sensitive measures to detect orthostatic hypotension in relation to postural changes. With these measurements, the researchers hope to gain more insight into the cause-effect relations in orthostatic hypotension. The main advantage of such a system is expected in the field of diagnostics. Is a sudden drop in blood pressure related to dangerous situations in and around the house? And if so, what can the patient do to prevent a fall? By recording vital information during a longer period of time in the daily situation, there will be more clues as to what activities introduce the highest risk of falling. The project will also explore if these insights can be used to build a preventive warning system. Furthermore, as in the NeuroCIMT programme the controller function of the nervous system is a central research topic yielding information on underlying causal processes, strong cross-fertilization is to be expected with the other projects of NeuroCIMT. Previous research has already yielded a sensor which measures the blood pressure and blood flow to the brain with sufficient sensitivity. This sensor will be transformed into a wireless version and will be validated in a clinical environment. 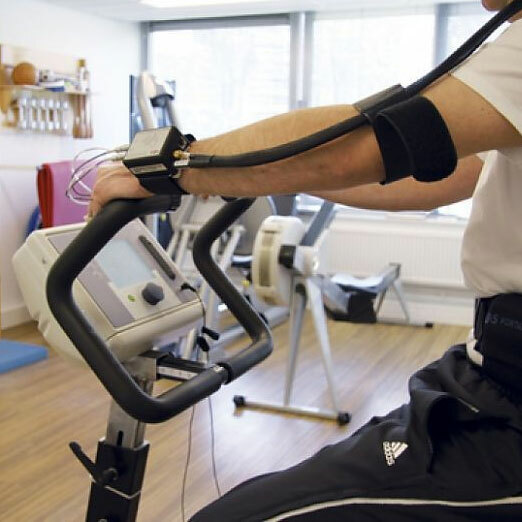 To develop a model describing the control mechanisms correlating blood pressure to posture, experiments will be performed with patients suffering from orthostatic hypotension or Parkinson’s disease. Patients will be asked to lie down and rise suddenly. With different techniques, the amount of oxygen flowing to the brain, blood flow and blood pressure will be measured. At the moment, there is no treatment for orthostatic hypotension. All knowledge about the mechanisms involved is welcome to enable development of an effective therapy.